Welcome to another edition of From the Newsgroups. In this installment we will look at a question posted in the Partner Online Technical Community newsgroup. The partner needed to know if it was possible to configure Microsoft Dynamics GP Business Alerts to submit posting errors to application adminstrators when using an auto-posting tool. 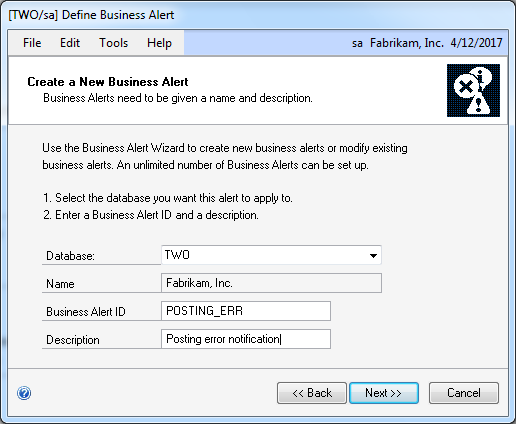 Q: Is it possible to setup a GP Business Alert to notify someone when a scheduled SOP batch (or any other GP batch) fails to post? The background to this is we are using MC2 GP Agent module to autopost the imported SOP invoice batches. This will happen many times a day. 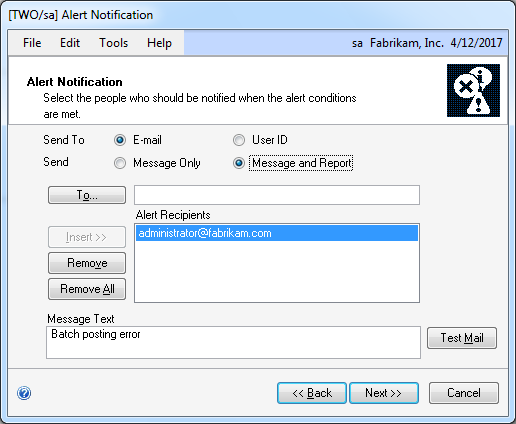 To avoid the need for a person monitoring the automated posting process, we want an alert to be generated when the posting process fails. The response comes courtesy of Dave Bader, Moderator of the Partner Online Technical Community, enhanced by me with pictures to facilitate the explanation. 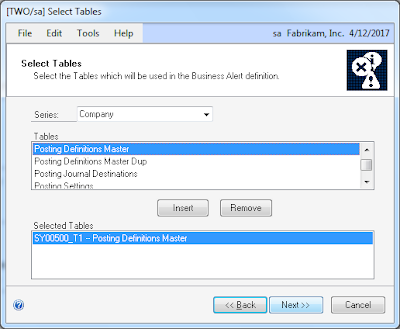 I have been looking at the SY00500 which is the Posting Definitions Master and I have an option that may work for you on the Business Alert. 1. 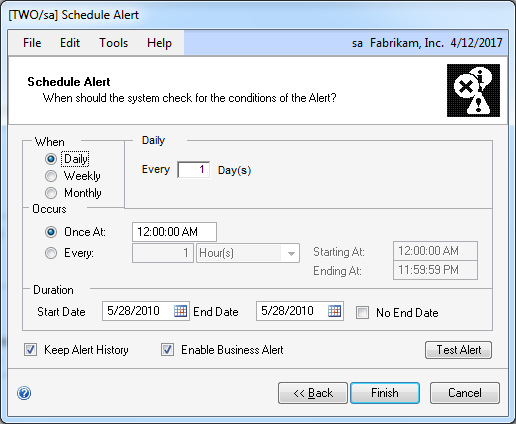 Create a new Business Alert. 2. Select the Series as Company. 3. Select the Posting Definitions Master as the Table. 4. In the Define Alert Formula window select the table and use the column name Batch Error Messages 1 and add that to the formula. 5. Select the <> symbol. 6. In the Constants field enter in 2 single quotes ''. 7. Select the OR symbol. 8. 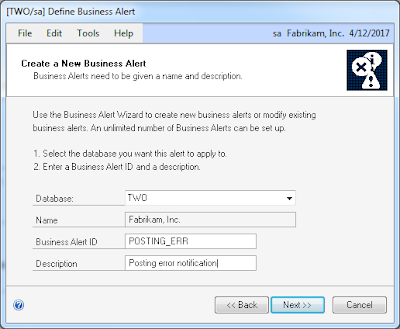 Select Batch Error Messages 2 and add that field. 7. Select the <> symbol. 8. In the Constants field enter in 2 single quotes ''. The formula should look like the following. 9. Click next and select the notification information and the message text. 10. 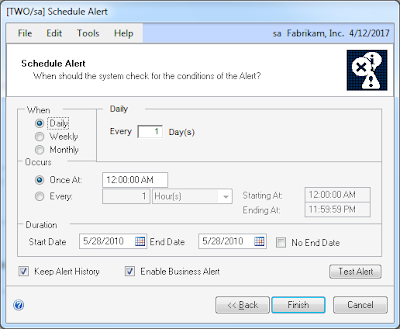 Click next and enter the schedule information. Below are the values that can be held in the error message fields. 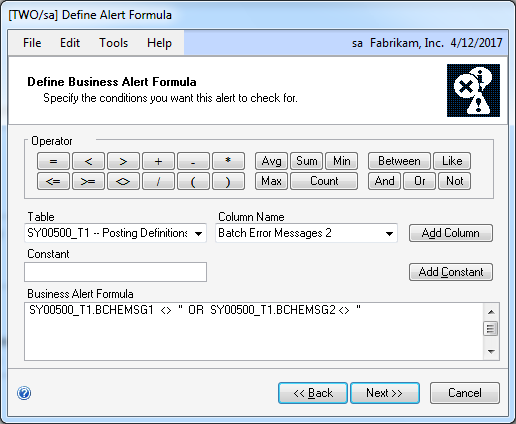 Messages 1: Indicates a general batch error causing the batch to not post. 23 - Fatal posting error occurred. Please revert to backup. 24 - Fatal posting error occurred. Please revert to backup. 25 - Actual number of journal entries does not equal the control number. 26 - Another user is editing this batch. Some information may not be updated. 27 - The Sales Order Processing module is not registered. 28 - The Bill of Materials module is not registered. 1 - The Receivables Management module setup information is missing or damaged. 2 - The Payables Management module setup information is missing or damaged. 3 - The General Ledger module setup information is missing or damaged. 4 - The Inventory Control module setup information is missing or damaged. 5 - The Invoicing module setup information is missing or damaged. 6 - The United States Payroll module setup information is missing or damaged. 7 - The Inventory Control module is being reconciled. 8 - The Inventory Control module is changing valuation methods. 9 - The Inventory Control module is changing decimal places. 10 - The Inventory Control module is performing a year end close. 11 - Not enough system resources. Please close some windows. 12 - The Multicurrency setup information is missing or damaged. 13 - The functional currency is missing. 14 - This company does not have access to the selected functional currency. 15 - The functional currency for this company is inactive. 16 - The Purchase Order Processing module setup information is missing or damaged. 17 - The General Ledger posting date is missing or invalid. 18 - The Bill Of Materials module setup information is missing or damaged. 19 - There is no Released transaction. 20 - The Euro Currency ID is inactive. I hope this information is helpful to you. Please post back if we can be of any further assistance. 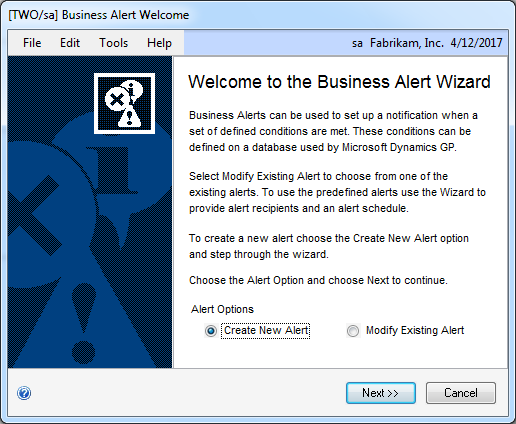 Business Alerts can be a powerful tool to assist Microsoft Dynamics GP administrators in their daily tasks by keeping an eye on a number of activities ocurring throughout the system. Definitely, this is one to keep in the arsenal of tips and tricks and one that I expect to see in a future edition of 50 MORE Tips in 50 Minutes session presented by my friend MVP Mark Polino. This is very good.. I have created this and come accross when batch had an issue. Is there any way that we can generate alert to know if any unposted bacth or transaction lying in GL. Basically I need to trace any system generated batch should be notice. we have GP Agent for our customer and is setup to automatically schedule posting certain times of the day, but we did not set it to have a posting journal to be created. I tried to make use of the email notification in GP agent but that does not seem to work or even send out an email notification. Is this post more or less like the workaround to that instead... alert if there is a posting prob? as the email notification of GP Agent for posting without reports do not work at all yet? Appreciate any feedback you may have. cheers! In the context that you described, it would seem that the approach described in this post could help with your situation, but I am not at all familiar with your environment, hence I strongly recommend you test it out first. In order to send out email notifications, you must have Outlook installed on the DPS. If you want the resulting report sent as an attachment, you need to assign a file name to the report destination for the task.